Menlo Park has joined Peninsula Clean Energy, a program that offers you options for more renewable power at or below current prices offered by Pacific Gas & Electric. Peninsula Clean Energy, or PCE, is the official electricity service provider for energy customers in San Mateo County. All City of Menlo Park public facilities have joined at the ECO100 level, utilizing PCE's 100 percent renewable and 100 percent greenhouse gas-free energy. All residents and businesses in San Mateo County are automatically enrolled through a phased process. Phase 1 was October 2016, and included all municipal accounts, small and medium businesses, and 20% of residential accounts. Those residential customers were enrolled based on randomly selected neighborhoods. Phase 2, in April 2017, included all other electricity accounts in San Mateo County. 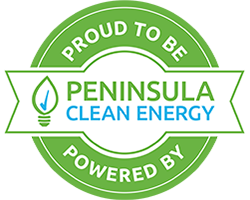 Peninsula Clean Energy sources electricity on behalf of its customers from renewable resources like water, wind and solar. There are two electricity options to choose from, ECOplus which is 50 percent renewable energy (default option), and ECO100, which is 100 percent renewable energy at a higher rate. To learn more, visit the Peninsula Clean Energy website or call 866-966-0110. Customers can opt out anytime.